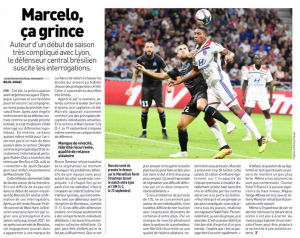 In July it was reported in both England and France that West Ham had made an offer for Lyon defender Marcelo. The player hadn’t been left ‘indifferent’ by the approach and it was claimed higher wages were a big part of the temptation, along with a desire to play in English football. It was then claimed the Hammers had offered to double the player’s wages and give him a long term contract, despite him being 31 years of age. Lyon refused the approaches and in August handed Marcelo a new contract lasting until June 2021. After that they would have expected the Brazilian to have his head fully focused and perform well for them, but he’s been experiencing some struggles reports L’Equipe. It’s explained he had an ‘unclear’ summer because of West Ham’s ‘concrete’ intent to sign him, but the new contract was supposed to clear those doubts. He was also promoted to vice captain status, but the French newspaper say he’s been one of Lyon’s ‘major personal disappointments’ this season. The Ligue 1 side could even look to bring someone in during the January window. In theory, that would allow West Ham to have another go, but it’s quite likely the London club won’t be so tempted then.